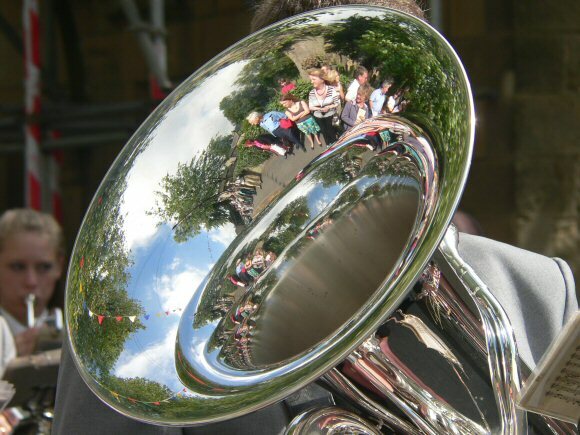 My photograph for 2007 was of a reflection in the bell of a silvered brass instrument, probably a euphonium. It is from a marching brass band in the well dressing procession in the village of Eyam, UK, in 2007. Most spectators with cameras appeared to be photographing the whole band but I thought that this tidy reflection, enabled by the unusual silvering of the brass instruments, made a more interesting and aesthetically pleasing view. Of course the biconcavity of the mirror meant that I was reflected in the middle but, using a long telephoto, I appear quite small and almost hidden. This has been the most popular of my Christmas cards so far, possibly as it satisfies different viewers' opposing desires: it has both a big bold feature and, on closer inspection, much colourful fine detail; both geometric and human interest features; and has a Christmas association (the brass band) yet is warm and summery (the scene and lighting). I usually stuck to wintry scenes for my Christmas card photographs, thinking them more appropriate, but an artistic friend liked this warmer scene from my short-list over all the more conventional ones as being more upbeat so I used it. It was the response from people who got it and requests for previous years' cards that persuaded me to at last put my Christmas cards on the WWW. The border was a duplicate of last year's rotated back from portrait to landscape format.